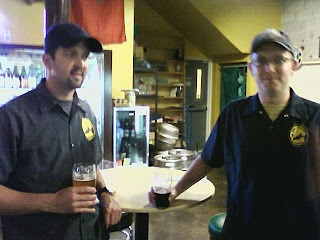 Another couple of nano-brewers have been subjected to my poor cellphone photography skills. That's Eric and Brian of Mt. Tabor Brewing, who brought a record-setting four varieties of their beer to the Beermongers for a meet-the-brewer event Wednesday evening. I had never tried any of their beers, so I was pleased to get to sample their Asylum Avenue IPA, Tabor Special Bitter, Calf Stout, and Soapbox Blonde. My favorite was the TSB, lighter in color than what I'd expect from an ESB, but a nice quaffable ale with a mild fruitiness and restrained hopping. I love hops, but there's a time and a place for them, and it's nice to have a bitter that's not too bitter. On the other end of the hop spectrum, their Calf Stout had tons of hops -- Eric said that it has a theoretical 128 IBUs -- but maintains its stouty balance. Interesting beer: it's the second run from a Russian Imperial Stout they brewed, and still clocks in at 5.3%. Nice job with the Reduce/Reuse/Recycle. It's not a milk stout -- the "calf" had people asking -- they call it that because its imperial Papa is called Sibeerian Bull Stout. I liked the Calf Stout a lot. Mt. Tabor beers are rare enough that -- as I said -- this was my first sample of them. So where can you find them? Vintage Cocktail Lounge (SE 79th and Stark) -- always has 2 or 3 taps from MTB. The brewers mentioned that the Beermongers keg of the Calf was the offspring of a custom order of the imperial stout that a fan ordered for his wedding. That's the stage Mt. Tabor is at right now -- if you want a custom brew for a special occasion, call them up and they're likely to make you a deal. Cheers to Beermongers and Brewpublic for arranging this meet-the-brewer. And don't forget to support your local nano. Labels: beermongers, meet the brewer, nanobreweries, where do I find...? Roscoe's is right there in that area too... and haven't seen them tap any Mt Tabor brews yet... wonder what their hold up is? Love the Mt Tabor brews. I think their main holdup is that they are operating on such a small system currently that meeting demand is impossible. Portland is lucky to have someone as creative and skilled as Eric Surface emerge in the beer scene here. I hope he continues at his talent.